This past week, the Maroon and the Gate repeatedly clashed on an issue as near and dear to campus affairs as the geopolitics of the Arabian Peninsula. Atman Mehta wrote in the Maroon to criticize a number of articles published in the Gate as uncritically echoing imperialist propaganda about foreign policy in the Middle East. Indeed, Mehta’s reading of the original Gate articles was inaccurate. However, the Gate’s Blake Fleisher then inexplicably penned a response to Mehta that makes Mehta’s case appear much more prescient in retrospect, as Fleisher’s rebuttal is first and foremost dedicated to marching in lockstep with Trump’s foreign policy team. Before diving into the many ways in which Fleisher’s article positions itself squarely in the line of fire of Mehta’s general critique, we must discuss what actually went wrong in Mehta’s article. Mehta takes aim at two articles published recently in the Gate: one by Noa Levin recommending the US withdraw support from the Saudi-led war in Yemen, and one by Jake Biderman discussing Israel’s “image problems”. This article will largely focus on the argument over Yemen, as we have less than zero interest in directly relitigating the Israel-Palestine conflict. First, Mehta contends that Levin’s article is a regurgitation of American propaganda. Levin’s article is many things, but imperialist regurgitation it is not. Mehta contends that Iran is not the “dire territorial threat” that Levin acknowledges it to be, and claims that Levin writes off the horrific and extensive war crimes of the Saudis by hand-waving them away as a problem for both sides. On the first charge, Levin is noting that Iran poses a territorial threat to Saudi Arabia, but not to America. She specifically mentions the threat in order to point out that fighting Iran in Yemen does little to accomplish any sensible American strategic goals. Instead, she is alluding to the fact that Iran actively seeks to gain power and leverage over powerful Arab states like Saudi Arabia, in much the same way that Saudi Arabia seeks to do the same to Iran and its allies. Each poses a material threat to the other, but Levin rejects American orthodoxy that said threat actually extends to the United States. On the second, Levin does blame both Saudi Arabia and Iran’s proxies for intentionally committing humanitarian atrocities, as is factually accurate. Levin comes to the conclusion that the United States should not assist and defend an ally such as Saudi Arabia who engages in such acts, which suggests that she does not consider the crimes of either side to be an excuse for the crimes of the other. Yet Mehta’s argument is not necessarily incorrect, despite his choice of articles to illustrate it. 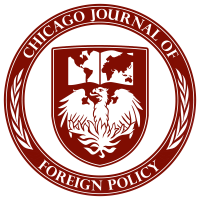 Mehta is seeking to point out that many on campus and elsewhere are too willing to accept the basic premises of American foreign policy as justified and good. The current American foreign policy consensus operates on the premises that Americans are the good guys, Iranians are the bad guys, the Saudis are (at worst) lapsed good guys, Israel’s security policies are largely justified and good due to its status as a “villa in the jungle”, and so on. As Mehta notes in his penultimate paragraph, if one accepts these premises, one can only offer deeply limited criticism or questions. In such a mindset, one can argue that Saudi Arabia should not commit human rights abuses in Yemen, but one must nonetheless accept that Saudi Arabia should seek to check Iran in Yemen. Accepting the current consensus on American foreign policy is to accept as a given that the Saudis are the good guys and should be supported, that the Iranians are the bad guys and should be contained, and that these two postulates cannot be validly questioned. Mehta advocates for a radically different discussion where we criticize not just the cost or the methods of policies, but where we may ask whether the broader aims of our foreign policy are ethically just aims to hold. This brings us to Fleisher’s article, which exemplifies uncritical acceptance of the right-wing foreign policy consensus far better than anything Mehta could have expected. Fleisher himself falls into the flimsy propagandizing that Levin is accused of when he vaguely alludes to Iran’s “nefarious regional activities”. His phrasing conjures up images of the Iranian Revolutionary Guard Corps as some sort of Snidely Whiplash type, ruthlessly scheming to strike down the just and noble American-allied Saudis for no reason other than evilness and spite. He then attempts to justify the Saudi war effort by painting Saudi fears of Iranian presence in the region as entirely justified, due to the damning fact that the Iranians are… present in the region. Fleisher points to the fact that Iranian proxies can and do launch missiles from Yemen at Riyadh, Dubai, and so on. Yet while the prospect of missiles fired from Yemen is surely very scary, the Arabian Peninsula is a very large place, and the Persian Gulf is substantially less so. San’aa (the capital of Yemen) is more than 600 miles from Riyadh, whereas nearly half of the entire land area of Iran lies within 600 miles of Riyadh. Dubai lies less than 100 miles from the Iranian mainland. Iran, of course, has short-range missiles like the Qiam capable of hitting targets 500 miles away, and has a small number of medium-range missiles capable of hitting targets 2000 miles away. If “the Iranians are close enough to fire missiles” is an acceptable ethical justification for a Saudi total war of conquest over a given space, then an American-backed Saudi invasion of Iran itself would be ethically just, on the grounds that Iran happens to be menacingly present within Iran. The only moral constraint that this position shared by both the Trump administration and Fleisher would impose is to ask the Saudis to play nicely while bombing the Iranian mainland. This is not to suggest that, actually, the Iranians are the “Good Guys” (obviously). The point is that when Fleisher contends that no one can honestly deny that the Saudi fears of an Iranian presence are justified, he implicitly contends that the Iranians are the threat and the Saudis are the threatened. This perspective justifies virtually all Saudi actions—no matter how horrific—as self-defense, and paints virtually all Iranian actions as invasive aggression, by assuming that the mere physical existence of “the other side” is unjustified due to the real threat it poses. This circular, epistemically absurd, and unfortunately very common approach to determining good and bad in foreign relations is what Mehta attempts to attack. In international relations, where military power is largely a zero-sum game amongst rivals, “they are just defending themselves” is usually little more than a euphemistic and unlimited excuse for the aggressive actions of a country we’re on good terms with in the status quo. In practice, both Iran and Saudi Arabia are deeply bad actors. Iran has used paramilitary organizations to target civilians with terror campaigns from Argentina to Iraq, just as Saudi Arabia uses American bombs and warplanes to target civilians in a terror campaign in Yemen. These facts should form the basis of our foreign policy. We should evaluate whether involvement in a conflict is actually a morally good act, and in the direct interests of the United States. “Defending themselves” is a completely insufficient and usually hypocritical standard. Instead, convenient and wholly arbitrary endorsements of one side of a conflict as the righteous defenders and the other as the nefarious aggressors underpin our foreign policy stances. Levin, thankfully, fully realizes this. Fleisher does not. By defending the Saudis as under threat while posing no threat themselves, he endorses the same sort of false moralizing that Pompeo and his ilk have used to justify tearing up the Iran deal and nudging America steadily towards a senseless war with Iran. Naturally, he refuses to ask why we deem one side of a conflict between two violent, institutionally anti-Semitic, thoroughly bad actors as actually good and the other as irredeemably evil. Fleisher’s theory of international politics would be satisfied if the Saudis only accidentally bombed children and medical facilities, instead of the current Saudi policy of overt war crimes that we both find abhorrent. However, Fleisher fails when he does not seek to ask the much more crucial question of why we have the objective of removing Iranian influence from Yemen at all. By taking it for granted that our objectives are ethically good, he rules any criticism whatsoever of American grand strategy as easily dismissable erroneous analysis. Those who wish to do so are encouraged to read Avi Shlaim’s 2004 article, The War of the Israeli Historians, and the works of Morris, Flapan, Pappé, and Shlaim that he references. The first tracks the historiography of the emergence of the Israeli-Palestinian conflict, and the rest do the actual historical work of recounting what happened. This is a phrase that the author heard multiple Jewish Israelis in Israel use to describe the security situation of their country, entirely independent of each other, this past August. It is telling that a phrase so incredibly racially loaded was used quite widely to justify any and all actions ostensibly in defense of the homeland. Previous: Previous post: A Future For China-India-Nepal? Maybe Not.